A clean room is a controlled environment where products are manufactured, such as aerospace, pharmaceuticals, bio-pharmaceuticals, electronics, and medical devices. It is vital that businesses that manufacture these products adhere to specific requirements that strictly limit the concentration of airborne contaminants. 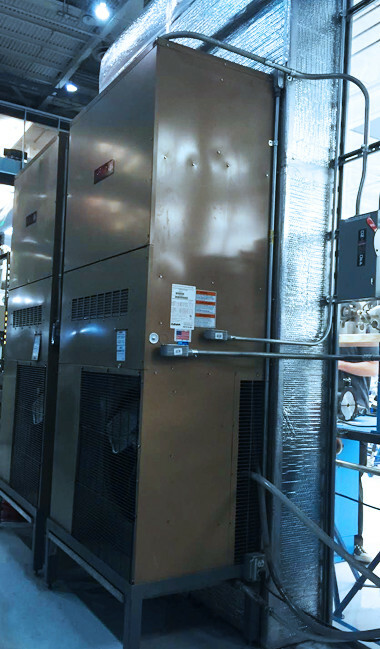 If your company depends on a clean room to ensure the quality of your products, our HVAC services can help you by installing and maintaining contamination-free environments. How? It is a straightforward issue of experience: we know there is more to a clean room than air filters. A clean room must be carefully planned out to control airflow rates, temperature, and humidity; then, the air must also continually cleaned through the use of specialized HEPA (High Efficiency Particulate Air Filter) filters. Exposure to pathogens, biological agents, and chemicals can lead to costly errors. Cutting Edge Services, Inc. HVAC services guarantees contamination-free environments. Our team has installed specialized equipment for clean rooms in the aerospace, health care and manufacturing industries. Preventative maintenance: It is vital that your clean room be completely functional at all times. We can be your in-house HVAC expert techs to service your clean room equipment on a regular basis. See our maintenance programs. Our maintenance programs include testing and certification strategies to ensure proper maintenance and operation of your system. Evaluation: Analyzing how the equipment we install and maintain interacts with the surrounding systems. Certification: Our comprehensive testing and certification services help you stay ISO (International Organization for Standardization) compliant and to ensure that your clean room meets the needs of your company. Call us to learn more at 714.532.5379 or email us.